When you think Southern food, you picture everything fried and buttered. Fatty, rich and delicious. It's a way of life here. But exactly what do you do when you decide to start eating healthier, more natural foods? While many people have the luxury of jogging over to the nearest Whole Foods, this small town Southern Doll does not. 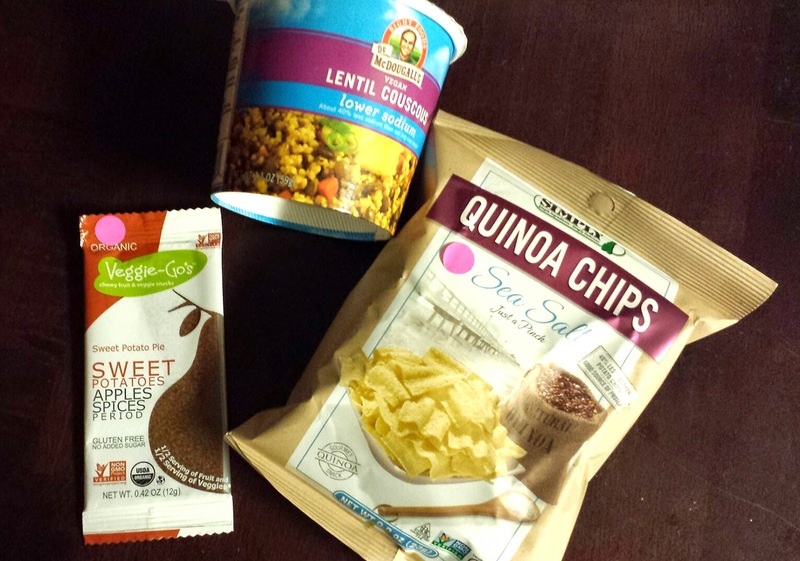 Want some Quinoa chips? Prepare to drive 40 miles to get them because no local store has it. It's a difficult task to take on and it is frustrating to no end. How can you make smart food choices when no one stocks what you need? That's why I have been so eager for this box! 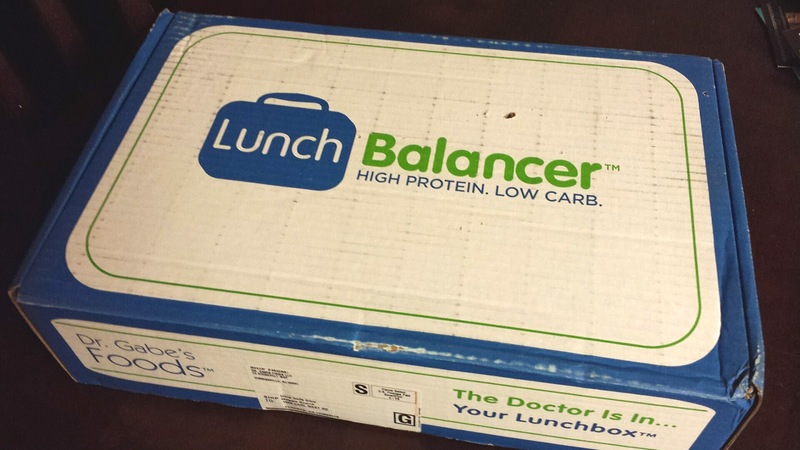 Allow me to introduce you to Lunch Balancer by Dr. Gabe's Foods! 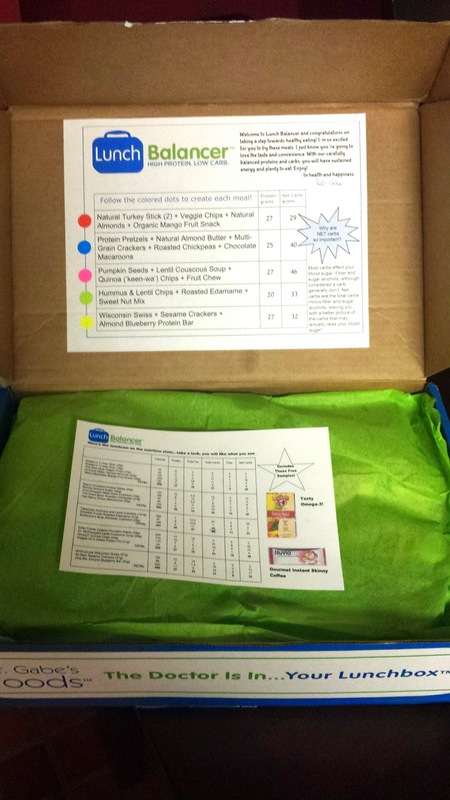 Lunch Balancer, who very kindly sent me this box for review, was designed by a team of doctors and nutritionists with the aim of finding simple on the go meals that give your body what it needs. We've all been there. You need something quick that you can throw in your bag and go out the door. For $32.00 a month (plus $8 shipping) you will receive a box with 5 convenient on the go meals that provide you with the nutritional benefits you need. Coupon Alert! Enter discount code AUGUST at checkout to get $10.00 off of your first months box! Offer valid through 7-31-14. 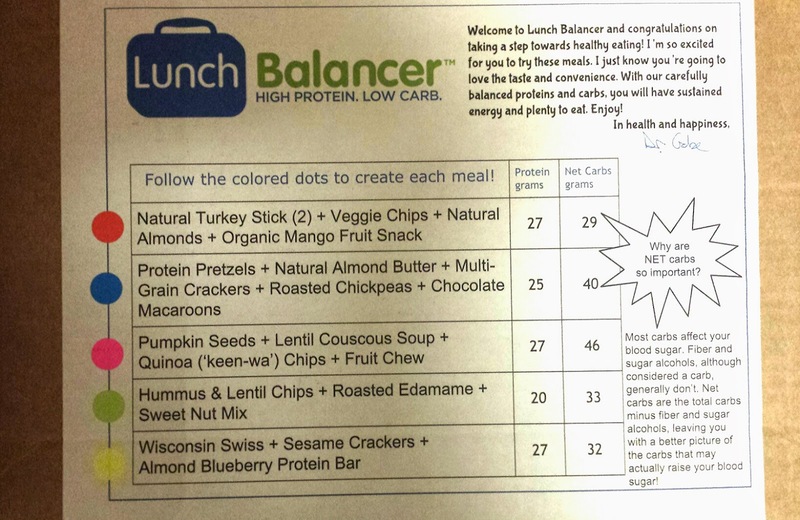 Every meal is color coded and you will receive a chart that gives you every items nutrition information. That is incredibly appreciated and convenient! You can see that you really get your money's worth with this box. Its large and completely full. 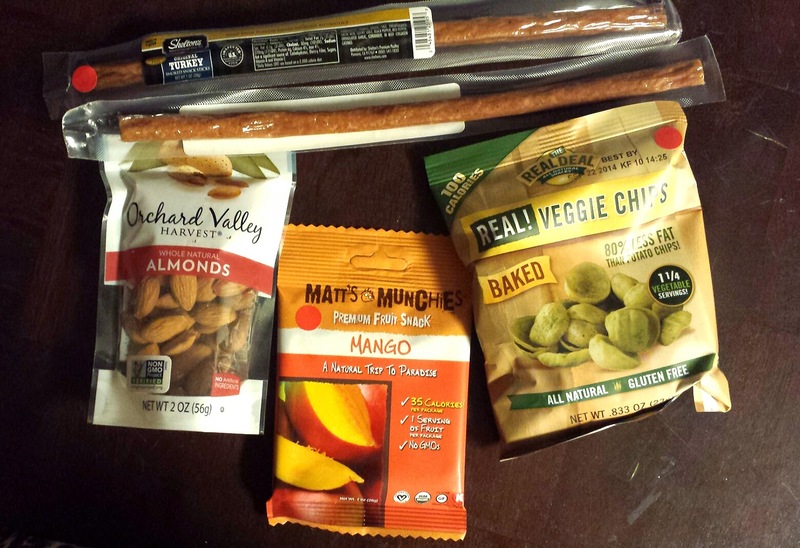 Meal 1 --- 2x Shelton's Turkey Sticks, The Real Deal Veggie Chips, Orchard Valley Harvest Almonds, Matts Munchies Mango Fruit Snacks. With only 555 calories, you've got a very satisfying meal! My husband really enjoyed the Turkey Sticks. 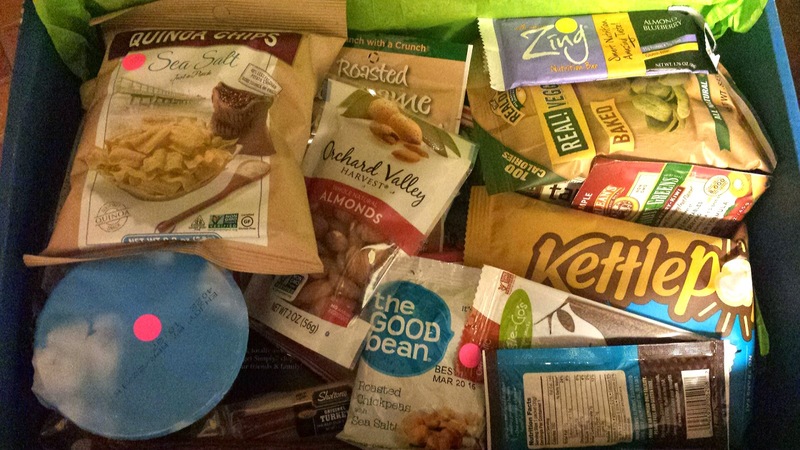 Meal 2 --- Kay's Cinnamon Pretzel Sticks, Barney Almond Butter, Crunchmaster Multi - grain crackers, The Good Bean roasted chickpeas, Hail Merry Choco Macaroons. Total calories 580. Dear lord the macaroons! These are absolutely amazing and I may very well be addicted to them now! 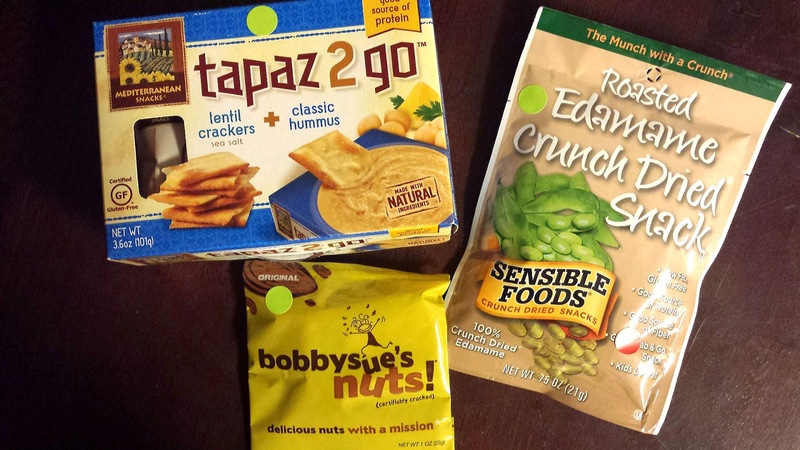 Meal 3 --- Tapaz2Go Hummus and Lentil Crackers, Sensible Foods roasted edamame, Bobby Sue's Nuts almonds and cashews. Total calories 497. Not my favorite meal but it wasn't to bad. Meal 4 --- Dr. McDougalls Lentil Couscous Soup, Simple7 Quinoa chips, Veggie Co's sweet potato pie, Edna Foods Organic Pumpkin seeds. Total calories 540. 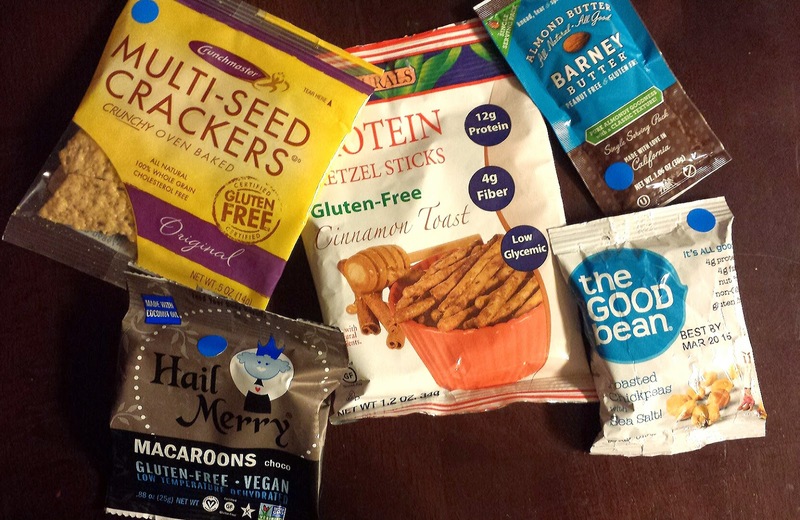 The quinoa chips were my favorite. They were light and perfect! 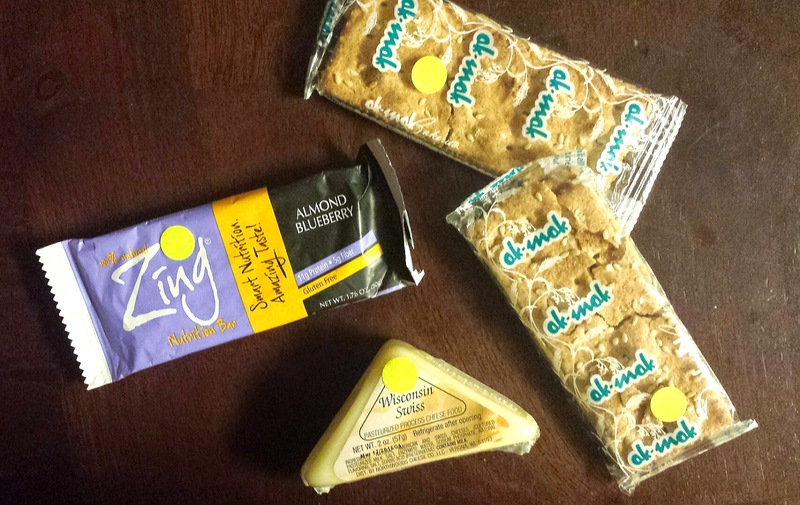 Meal 5 --- Northwoods Wisconsin Swiss, AkMak Sesame Crackers, Zing Bar Almond Blueberry bar. Total calories 488. The cheese was my husband's favorite on this one. He really enjoyed it! Not only am I impressed with the amount of product in this box and how good it is for you, I also couldn't believe how flavorful it all was. It's satisfying and affordable, breaking down to about $6.50 per meal. The convenience of it is wonderful and it's well worth every penny you pay! An all around great box! Have you tried out Lunch Balancer yet? What did you think? I love to hear your thoughts and opinions!